"It sure is frustrating to be the last one in your class to become a member of the Missing Tooth Club. When Trevor finally discovers that one is loose, he is excited and scared. Kids give him warnings about offers of help from siblings and parents to expedite removal of the loose tooth. Trevor isn't sure that he wants any help and Mom is always reassuring, 'Just wait. That tooth will come out when it's ready.' Well, it does finally come out in a most amusing way. Lots of humor to help kids impatiently waiting for that first tooth to start wiggling." "Almost everyone in Mr. Thompson's diversely populated first-grade classroom wears a wide smile displaying missing teeth. Trevor, though, has all of his, although one is loose. As classmates tell how various family members attempted to remove their teeth with mention of string and pliers, the boy becomes anxious. However, Grandma Sally assures him that the tooth will come out when it's ready. That Friday, she goes to Trevor's class to teach the students how to make taffy and when everyone samples it, the inevitable happens. The story adequately addresses some of the anxieties children may have over losing their first tooth..."
"What fun! 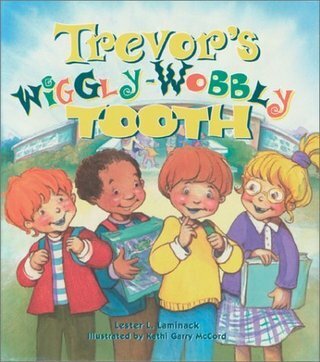 If you want children to laugh right out loud, read Trevor's Wiggly-Wobbly Tooth, a story that youngsters, teachers and parents easily relate to. Children get into the story by predicting how Trevor's tooth will be extracted and by telling their own first-tooth stories; expect lots of discussion following the reading. The plot is appealing, the characters are real, and the laughs are genuine. After reading it once, expect to be asked to read this book again and again. It goes into the basket of favorites!"